Moliere was 51 years, 1 month	& 2 days old age. Moliere was born on 15-01-1622 in Rue Saint Honore, Paris, France. He was a French Writer, Poet, Playwright, Dramatist, Author, Theatre Actor & Comedian. He was born with the name of Jean-Baptiste Poquelin & was famously known as Moliere. 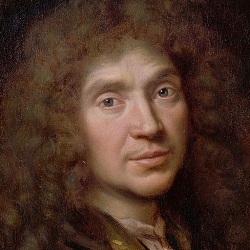 Moliere died on 17-02-1673 in Rue de Richelieu, Paris, France at the age of 51. He was born to Jean Poquelin & Marie Cressé. Her mother belonged to the prosperous bourgeois family. He had two sisters named Catherine Poquelin, Marie Poquelin and three brothers named Jean Poquelin, Nicolas Poquelin, Louis Poquelin. On 20-02-1662, he was married to a French actress Armande Béjart, daughter of his co-star actress Madeleine Béjart. He had a daughter named Marie Madeleine Poquelin and two sons named Pierre Poquelin & Louis Poquelin.